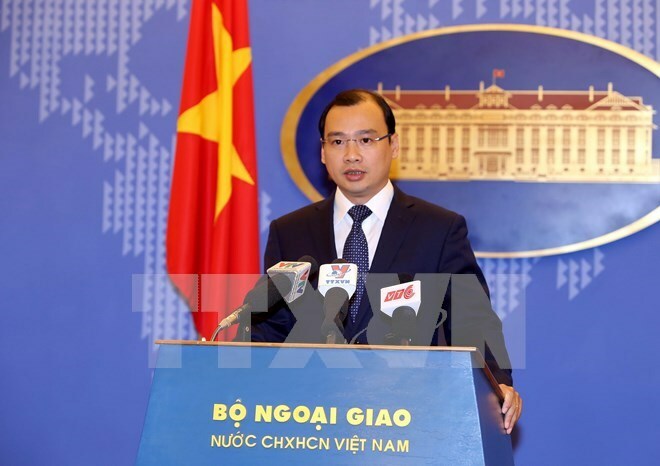 Hanoi (VNA) – Vietnam calls on relevant sides to take responsible and constructive actions in maintaining peace and stability in the East Sea, said Foreign Ministry’s Spokesperson Le Hai Binh. The spokesperson made the appeal on February 25 in reply to reporters’ queries on Vietnam’s response to China’s deployment of warplanes to Phu Lam (Woody) Island in Vietnam’s Hoang Sa (Paracel) archipelago and its construction of a high frequency radar facility on several features in Vietnam’s Truong Sa (Spratly) archipelago, as well as news released by the US media that the country may put mobile artillery weapons in the East Sea. At the ministry’s regular press conference, Binh noted Vietnam’s hope that the parties will respect the UN Charter and international law, especially the 1982 UN Convention on the Law of the Sea (UNCLOS) and the Declaration on the Conduct of Parties in the East Sea (DOC). “Vietnam has indisputable sovereignty over Hoang Sa and Truong Sa archipelagoes,” the Foreign Ministry’s spokesperson said. The spokesman said China’s acts, regardless of objections and concerns raised by Vietnam and the international community, not only seriously violate Vietnam’s sovereignty and accelerate militarisation in the East Sea, but also threaten peace and stability in the region as well as maritime and aviation security, safety and freedom in the Sea. “Vietnam strongly opposes to the actions that seriously infringed its sovereignty and demands China have responsible and constructive words and deeds in maintaining peace and stability in the region and the world in respect for international law,” Binh said. Maintaining peace, stability, and maritime and aviation security and safety in the sea is the shared interest of all countries in and outside the region, Binh noted. Asked what Vietnam’s viewpoint would be if it is suggested the country should join a patrol with the US and its allies, the diplomat said Vietnam has conducted normal activities in the region in line with the country’s law, and international law, particularly the 1982 UNCLOS. The activities, which are performed by Vietnamese competent agencies, have always contributed to peace and stability in the region and the world at large. Vietnam has repeatedly voiced its viewpoint of respecting innocent passage through the country’s territorial waters in tune with relevant rules stated in international law, especially the UNCLOS, he said. Vietnam suggested countries make constructive and pragmatic contributions to peace and stability in the East Sea, and respect international law. The country’s foreign policy of independence and self-reliance has contributed to keeping peace and stability in the region, and received high appraisals from countries in and outside the region, Binh said. Regarding ongoing tensions in the East Sea, the spokesman said the recent developments in the region, especially in Hoang Sa and Truong Sa archipelagoes, show that the region’s status quo is being broken, and what is most worthy of worry is the militarisation of the East Sea.